Quick summary: In this lesson of theory and art making, students will explore art and sustainability, focusing on the idea of conscious consumption. They will analyse the work of contemporary artist, Gwyneth Leech and create an artwork on found objects that convey a message of conscious consumption. Students understand how subject matter influences an artwork’s underlying message. 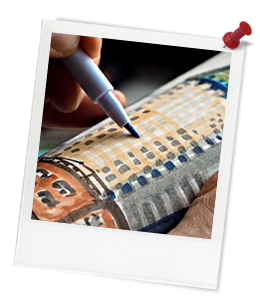 Students are able to combine 2D and 3D art making techniques. Students are able to select subject matter and art conventions to convey a message about sustainability. Relevant parts of Year 9 & 10 achievement standards: By the end of Year 10, students evaluate how representations communicate artistic intentions in artworks they make and view. They evaluate artworks and displays from different cultures, times and places. They analyse connections between visual conventions, practices and viewpoints that represent their own and others’ ideas. They identify influences of other artists on their own artworks. Students manipulate materials, techniques and processes to develop and refine techniques and processes to represent ideas and subject matter in their artworks. Resources required: Student Worksheets – one copy per student. Device capable of presenting a video to the class. Student’s own Visual Arts Process Diaries, Pitt Artist pens or Playing & Learning Brush Markers (class set), colour wheels, Optional: Colour Theory Factsheet. Keywords: Sustainability, art, drawing, conscious consumption. Students understand how subject matter influence an artworks underlying message. Students critically analyse artworks with messages of sustainability. Students create artworks on found objects. Students are able to convey a message of sustainability through drawing technique and a simple found object sculpture. Thought starter: Coffee cups make up 23% of our litter volume! Why might Gwyneth’s walking to work be important to her practice? What mediums does Gwyneth use? Why do you think Gwyneth adds details to the bottoms of the cups? 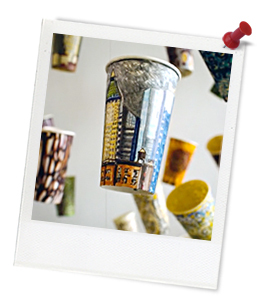 Does the use of coffee cups adds to Gwyneth Leech’s artworks? If so, how? Overall, do you think these artworks are drawings, sculptures, performance pieces, installations or something else entirely? Why? Finally, considering your responses to the above questions, what messages do you believe the artist is trying to express in her coffee cup artworks?